I’ll admit that from the time I first got this game until about 17 seconds ago, I have called it “Electronic Dungeons & Dragons”. Looking at the wiki article, not to mention the actual picture I took of my own copy, I now realize that the actual name of the game is “Dungeons & Dragons Computer Labyrinth Game”, which is great because I’ve now had the opportunity to type the word labyrinth more times today than I have any time previously over the last 20 or so years. I may be in the minority by liking this game so much. I checked the Board Game Geek page, and it’s average rating is (as the writing of this post) only 5.87 out of 10. Well, I don’t care, and I’m here to profess my great fondness for it. I’ve just had too much fun with it, and I still find it very fun to play to this day. Before I get to the details of the game, I should mention that while the game is pretty old, it’s not very hard to come by in online auctions. The pictures I took for this article are of a copy that I bought about 3 or 4 years ago because I have no idea what happened to the one I had as a kid. I suspect that my parents sold it at a garage sale while I was in college, because I found out several years ago that they had done just that with some of my other stuff. I got this one for a steal at around $20 on ebay and it’s in perfect working order. 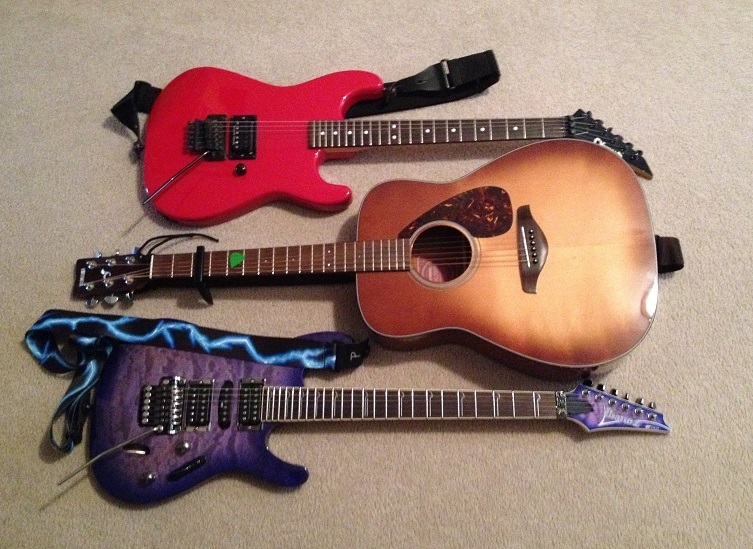 Current auction prices are anywhere from $10 to $100, with the average being around $40. The game can be played with one or two players and it consists of an electronic board full of pressure pads laid out in a grid. These represent rooms and hallway sections that you move into by pressing on them (either with your finger or with the included figures). 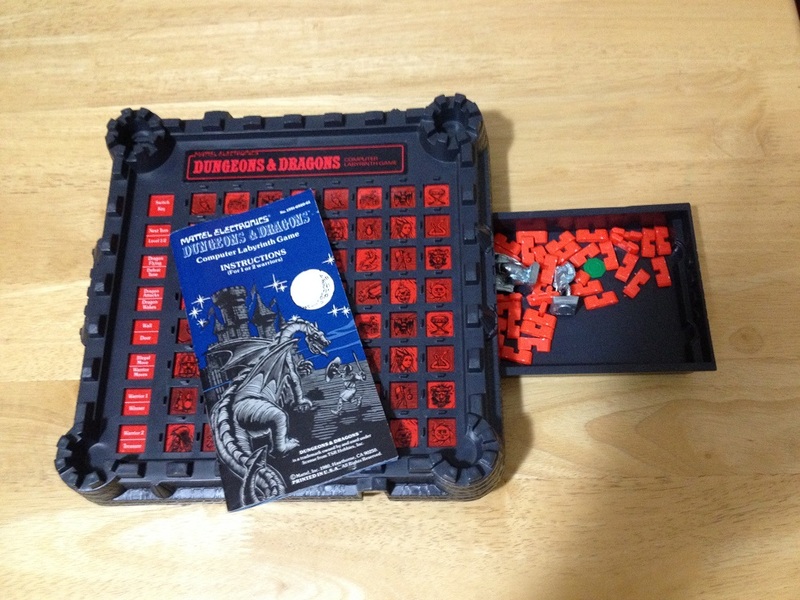 It also comes with a metal dragon figure, a metal treasure chest figure, and two metal warrior figures (metal as in made from metal, not as in dressed with spikes and leather and carrying guitars). There are a couple of plastic markers to identify each player’s home base and the treasure room (once you’ve found it! ), and of course an instruction booklet. So what’s so fun about the game? It’s really the sense of mystery and intrigue that you get from not knowing where anything is and trying to discover the treasure. At the beginning of the game, you select a home base spot and mark it with a plastic marker, and if you’re playing a two player game, your opponent does the same thing. At that point, there is nothing else on the board. 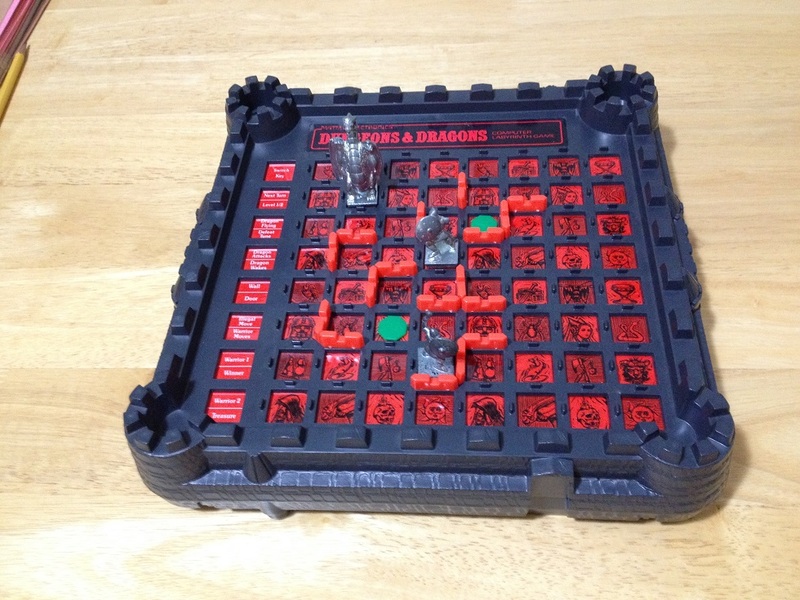 The game randomly generates an invisible maze that includes the location of the treasure, the location of the dragon (always within a specific number of spaces from the treasure) and the location of walls. You get up to 8 moves per turn, can only move vertically or horizontally, and your goal is to move from square to square to try to work your way toward the treasure, capture it, and get back to your base without being eaten by the dragon. As you move around the board, the sounds you hear will provide information. For instance, if you hear a short beep, it means you successfully moved into a room. If you hear a series of repeated beeps that speed up, you’ve hit a wall and have to move a different direction. When you hit a wall, you place a red wall marker on one of the pegs between the rooms to keep track of where the walls are located, and you lose any remaining moves you have for that turn. Eventually you’ll either hear a buzzing sound or a victory dance sound (keep in mind that these sounds are pretty primitive sounding by today’s standards; they’re just basic variations of beeps, but each is very distinct from the others). The buzzing sound means you’ve gotten close to the dragon and that he’s awake and not happy. You have to estimate where he is based on which square you’re on, and you put the dragon figure on a square nearby. You’ll never really know exactly where he is until he attacks one of the warriors. He will start chasing the nearest warrior until someone has the treasure, at which point he will move to attack and get the treasure back. When you’ve found the treasure, you can only move 4 spaces at a time due to the weight of carrying it. There is a plastic marker to mark the treasure room, and if the dragon kills you while you have the treasure, it immediately goes back to it’s room. Now the dragon is pretty vicious, but he can only move one square at a time, although he can fly over walls and move diagonally. And if you aren’t carrying the treasure when he attacks, he doesn’t kill you outright. He wounds you and sends you back to your base the first time he attacks. 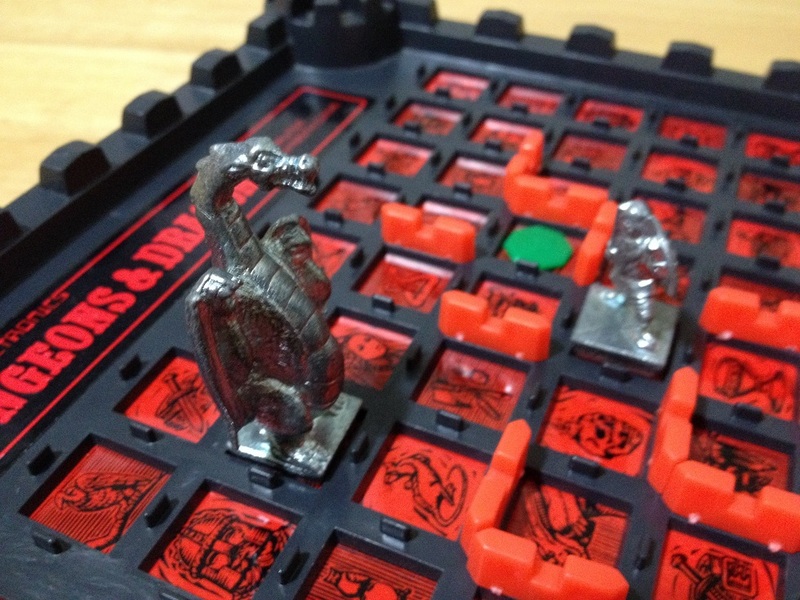 Having now been wounded, you only get up to 6 moves per turn, making it a little more difficult to get to the treasure and maneuver away from the dragon. If you get attacked again, the same thing happens except that you are then reduced to 4 moves per turn. After a third attack, you can cancel your phone and internet subscriptions because you’ll no longer be needing them. Having said that, if you have the treasure when he attacks, your character dies instantly regardless of whether or not you’ve been attacked previously. Eventually one of the players will either find the treasure and return it to their home base, or the dragon will win by finishing off the players. Admittedly, when you first learn how to play the game, it can be a little hard to keep track of the dragon’s movements and keep track of who’s turn it is (each player has their own special beep to indicate when a new turn starts), but it’s pretty easy once you get used to the sounds. If you don’t mind the old style electronic noises and if you enjoy dungeon crawl games, this is a great game to pick up. 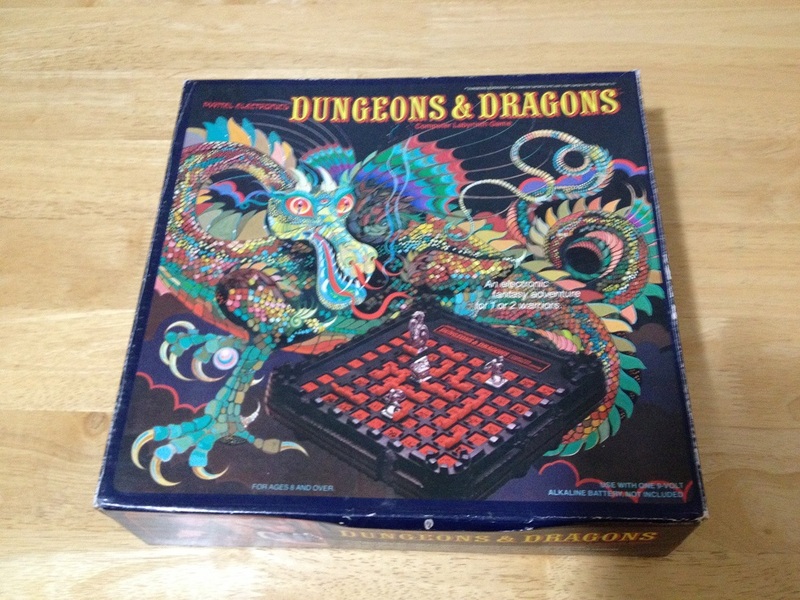 Thanks for taking the time to read about one of my favorite old board games.